What is the difference between the two thicknesses mentioned in my quote? The smaller thickness related to a lower R-value as allowed by the Thermal Insulation Products and Systems Association of South Africa (TIPSASA) for roofs that are equipped with a radiant barrier. A radiant barrier consists of a plastic-based composite material with foil and is laid directly under the roof in place of PVC waterproofing. The higher value is where there is no radiant barrier in the roof and the only thermal protection comes from Eco-Insulation. It's only 35mm difference, why will I need it? Both the SA Bureau of Standards (SABS) and the Thermal Insulation Products & Systems Association of South Africa (TIPSASA) require insulation to comply with a minimum R-value in order for it to perform adequately. R-values and resulting thicknesses are specified by climatic region. There are certain unscrupulous installers and also certain supermarket grades of insulation that do not comply with the required minimum R-value specification, and hence will not perform adequately in the roof. This means the home will not gain the full benefit from its insulation – effectively making the installation a waste of money. What happens with the downlights in my ceiling? Downlights are a common feature of many South African homes and form a part of many of Eco-Insulation's standard installations. Whichever form of insulation is installed, downlights or recessed lights need to be kept clear of the insulation material. Downlights, especially 50 watt halogens can easily reach temperatures of up to 300°C, which is a spontaneously combustible temperature. Eco-Insulation installers wherever possible place a protective sleeve around the unit to prevent the insulation product from coming into contact with the down light. Where it is not possible to place the sleeve around the downlight because the unit is situated next to or under a roof truss then a clearing of 200mm is made around the unit. I have a flat roof house – can I insulate it? 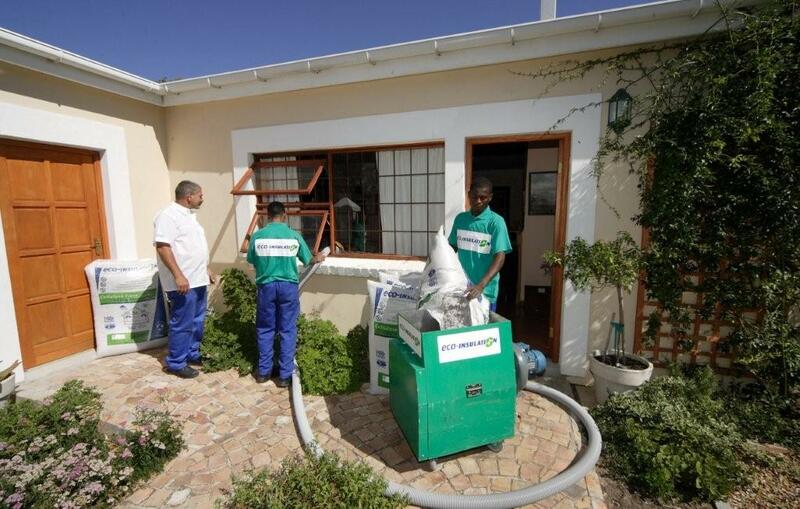 Yes, that is the prime advantage of pumped-in cellulose insulation such as Eco-Insulation. A large number of flat roofs are successfully insulated this way, so consult your local installer in this regard. Note however that due to space constraints created by the width of roofing beams in the case of exposed roof trusses, it may not be possible to pump in the full specified thickness of product. Can we put it over the existing glass fibre insulation. It is better to remove the old non-performing insulation first. This is to ensure the maximum integrity of sealing ability of the layer of Eco-Insulation that is pumped into every nook and cranny. Eco-Insulation offers a special service whereby we remove old broken down insulating material and dispose of it by means of local government approved waste facilities. Do I have to top-up after a couple of years? Under normal circumstances, no. All loose-fill insulation settles after installation. So in accordance with national building codes Eco-Insulation is specified and installed at a settled density. The weight and bag count of required material on Eco-Insulation's coverage chart provides the exact information pertaining to the amount of insulation that must be installed to produce the specified R-Value. What happens if need to get to wires etc in roof once insulated? if disturbed will it still work? Most modern ceilings carry a combination of wires from electrical to alarm wires etc. Eco-Insulation's product will neither damage nor corrode the wiring. The beauty of our product is that it can be moved to one side to allow access to the ceiling area, and then simply redistributed again without loss of performance.